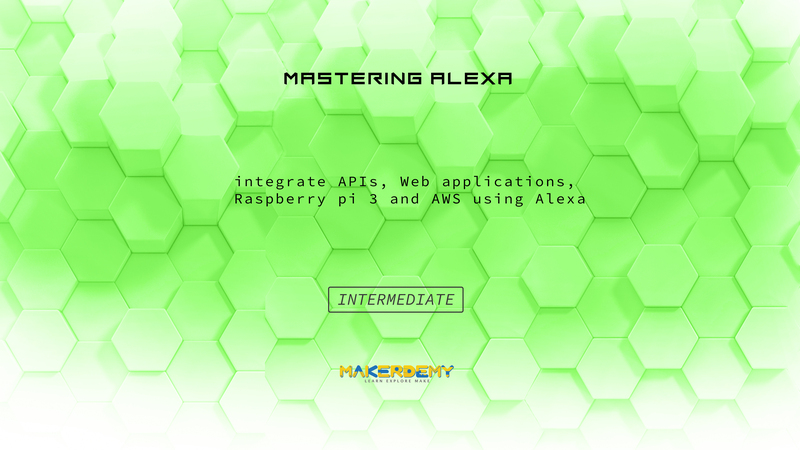 Hello learners, this is an Intermediate level course on Alexa Skills Development, which will enhance your knowledge on building Alexa Skills, as you will learn about integrating APIs, Web applications, Raspberry pi 3 and AWS IoT along with an Alexa Skill. The course begins with the date skill, a skill that will interact with the Wikipedia API to get useful information of a date. After that, a simple IoT Skill, which will help you understand the basics of interacting with AWS IoT. Then, the color game skill, where you will build an Interactive web game with an Alexa Skill, which will help you understand the changes required for controlling an existing web application using an Alexa skill. Lastly, the Raspberry pi-car skill, where you will learn to control the Raspberry pi-car using an Alexa Skill through AWS IoT.